My Embroidery treasures from around the world, some of which I've made myself. 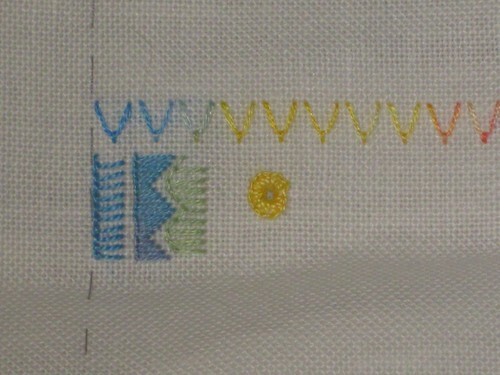 The TAST stitch for this past week was the Buttonhole Stitch. I did 4 little samples, one even on top and bottom with a pearl cotton, 2 threads between stitches; one with the legs stepping up and down with a silk floss; one with the header undulating, with another silk floss; and a buttonhole eyelet with pearl cotton #8. I think I have to do one more sample, just to balance out what I have here... one horizontal line of stitching sort of wrapping around or framing the eyelet. The challenge will be picking the right color. I am trying to let the fly stitches guide the color selection. I looked through my metallic/silk drawer, and found a couple of appropriate threads, and through my pearl cotton #8 drawer, and found a couple more. I should be set for threads now. I really enjoyed working these stitches, and I'm excited to see what the next stitch is. I'm also working on the header, working on pricking my pattern so I can use the powdered charcoal to transfer the lines to the linen. I will try to take pictures of the process. There will be room at the top for the date and some initials too. Over the years I've accumulated many embroideries from around the world, and I thought this would be a good way to share and describe my treasures, including some I've made myself.